Bakri A, Mehta K, Lance D. (2005) Sterilizing insects with ionizing radiation. In Sterile Insect Technique: Principles and practice in area-wide integrated pest management (Dyck VA, Hendrichs J, Robinson AS eds.) Springer, Dordrecht. pp. 233-268. Knipling EF. (1955) Possibilities of insect control or eradication through the use of sexually sterile males. J. Econ. Entomol. 48(4): 459-462. Kumano N, Haraguchi D, Kohama T. (2008) Effect of irradiation on mating performance and mating ability in the West Indian sweet potato weevil, Euscepes postfasciatus. Entomol. Exp. Appl. 127(3): 229-236. 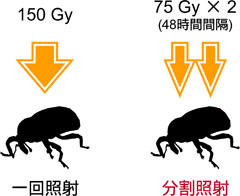 Kumano N, Haraguchi D, Kohama T. (2008) Effect of irradiation on mating ability in the male sweetpotato weevil (Coleoptera: Curculionidae). J. Econ. Entomol. 101: 1198-1203. 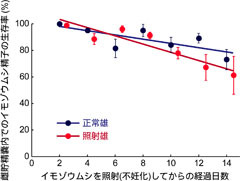 Kumano N, Haraguchi D, Kohama T. (2009) Sperm storage and viability within females of Euscepes postfasciatus: Effect of irradiation on sperm behavior within female. J. Insect Physiol. 55(9): 813-817. Kumano N, Kuriwada T, Shiromoto K, Haraguchi D, Kohama T. (2011) Prolongation of the effective copulation period by fractionated-dose irradiation in the sweet potato weevil, Cylas formicarius. Entomol. Exp. Appl. 141(2): 129-137. Kumano N, Kuriwada T, Shiromoto K, Haraguchi D. (2012) Effect of low temperature between fractionated-dose irradiation doses on mating of the West Indian sweetpotato weevil, Euscepes postfasciatus (Coleoptera: Curculionidae). Appl. Entomol. Zool. 47(1): 45-53. 松山隆志 (2013) 久米島におけるアリモドキゾウムシの根絶防除. 植物防疫所病害虫情報. 100. 栗和田隆 (2013) サツマイモの特殊害虫アリモドキゾウムシの根絶に関する最近の研究展開. 応動昆 57(1): 1-10. 伊藤嘉昭(編) (2008) 不妊虫放飼法－侵入害虫根絶の技術. 海游舎, 東京. 327 pp.